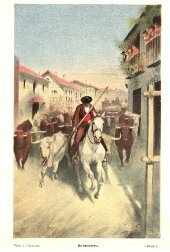 The Bullfight Digital Library (BDL) is an initiative from the Castilla y León’s Government Culture and Tourism Department. Its main goal is to offer a collection as wide as possible about written works or different resources on the topic of the bulls during the centuries to every interested person. It is enclosed within the general project of the Castilla y León Digital Library. The repository includes not only books and magazines but also posters and pamphlets. The principal work weight comes from the Library of Duque San Juan de Piedras Albas.The Avila Public library and the Museum contain the bibliographic resources and the museum collections that the Duque created. He was a great fan of the bull world and friend to many of the most famous bull fighters from the end of the 19th Century and beginning of the 20th. Thanks to this fact and his joy for collecting he started to gather books and magazines about the bull world that led to a whole collection of both paper and silk posters, pamphlets, leaflets, engravings and pictures. BDL currently holds more than 900 resources covering the time from 1652 to 1975, although the majority belongs to the 19th century and beginnings of the 20th. The initial collection will be continuously fed with more bull related resources belonging to the libraries of Castilla y León. Besides, the Bullfghit Digital Library is open to any incorporation suggestion the users may have, especially those ones who are interested in spreading their works in the internet, since is a part of Hispania, the Spanish Digital Library and Europeana, the European Digital Library.